Plants vs zombies was my favorite childhood game and I decided to replay this game over because I did not totally beat the game but I wanted to try too. Today I was playing and proceeded to close the app, I then reopened the app and it was normal saying “fetching data” and stuff like that but right after that it was stuck on the blue screen and I waited for 5 minutes and something did not happen. Anyone has any solutions?? I will keep it short and sweet. This game is absolutely outstanding and possibly one of the best mobile games of all time. However the micro transactions are sinful and make the game worse. Also many problems with loading and saving the game. While writing this I am trying to recover my save because I accidentally deleted the game. I downloaded the app, opened it, out in my age, and then it just sat at a weird swirly screen and did nothing. What is this?? I had this game when it first came out and it would always crash or freeze. Then I downloaded the game again a few days ago after not having it for almost 3 years and it’s back to freezing and crashing. I can’t be the o my one this is happening to. After a game an add will pop up for one of those word cross or jewel games. Then, it will freeze and not let me move past it until I restart the app. It won’t happen with the video ads. Every time I want to play I have to restart the game. It also happens when you play the ads for coins. Great Game , fun modes, and amazing levels ,this is not only fun, but good story too! 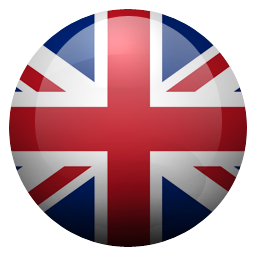 Check this game out, see for yourself! This use to be a great game but now it just wants to download...forever...and it always runs into some snag when it’s at 80%- either not enough space- ok delete some stuff. Then, server timed out- ok, try again...phone went to sleep while downloading...start again. I think it’s why I deleted it a year ago, and thought I’d try again. Nope. Still not functional. Too bad, it was fun. Every time the round is finished it seems to get stuck and never go back to the menu so I am sitting here waiting for it to go back and it never does so I have to force close the game and come back to it, is there a way to fix this problem? Hey pop cap I have an idea why not add pumpkin again? I love the game however you guys can’t cheat us and bring all the mints back for only one week 🙄. Can we at least get like a month to try to get all the mints that you guys created ? I want all of them and I only have 3 days left to get only one!!! I want all the mints ! Plus can you create other ways for people to get mints ? Make piñatas with mints in them, be able to win mints in games etc. thanks guys ! I love this sequel to one of my favorite games. But are all the ads necessary? Really takes away from the experience and makes me want to quit after each level. Good Game but needs more Minigames! I’ll tell you what needs to be added. There need to be more minigames like the vase breaker. Because I'm bored with only having 1 minigame. Maybe to fit the minigames you could maybe make a minigame page? Make it so the chomped can’t eat you in midair please and I also love this game so keep the good work. Ads for coins/gems/gauntlets don’t complete and don’t pay out. Game is now unplayable. Love the game, but leveling plants should have been saved for #3. While playing this game my device broke, later on when I got this game back I found all of my progress was gone and I wasn’t able to bring it back. Plants vs Zombies is without a doubt the best game I’ve e very played! 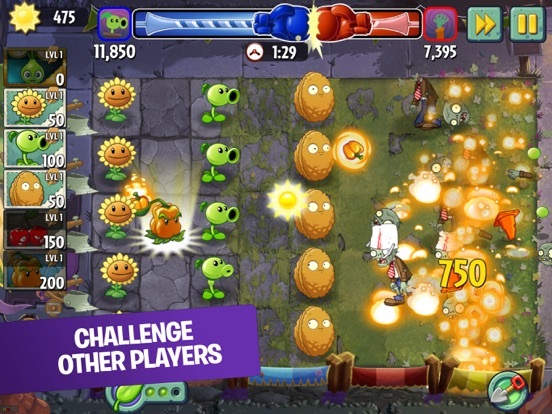 In this tower defense game, players use plants to protect their house from constant waves of zombies. There is also so much more. 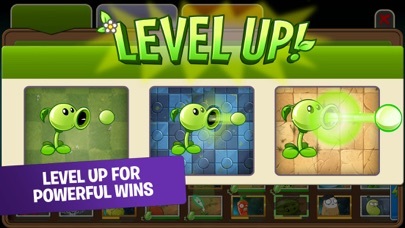 You battle against other players, you play to unlock new plants, and use seed packets to level their plants while also using them to unlock plants. Overall, this is the best game I’ve ever played. Great game but too many ads ruin the experience for me. Constant ads almost after every level. Many of which you can’t skip after 5 seconds. Completely annoying. I like this game and respect it as a great game. So, here’s a few things that I DON’T like about the game. One, is that the tutorial never ends.Two, is that there is ads. I know you can pay to take the adds out but what about the people who don’t want to pay!? So, it’s not a lot of things that I don’t like about the game so other than that, this is actually a ok-good game. 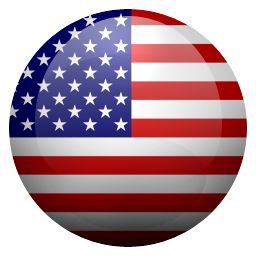 With respect,from,a person from the USA. You are doing great with the game! It’s very creative, fun, and entertaining! I love it, keep up the good work! leaving almost everything behind a paywall for a game that shouldn’t cost more then 30 dollars for every locked plant, do like a dollar a plant or something. Come on. There is also a bug that make it so you can’t leave a battle and need to close the whole app after you win. I think this game is super fun and has good graphics but I want new islands and a breeding feature. For example if you were to breed a ice pea and a fire pea you could get a rock pea just for example. The is very great!but alot of the great plants cost money and I can't get them. This game is straight up amazing. I really like how you added battles so we don’t bore out. Awesome game, I love everything about it, and how much work was put into detail. The only thing that I don’t like, but don’t blame you, lame myself, is the fact that I don’t have any of the purchasable plants. But hey, that’s on me, not you. Amazing game. Stop with the greedy micro transactions and this would be a 5+ star game. It’s just not worth the time to level up plants anymore since you keep adding more to the game anyway and also why do we have to have seed packets to get new plants now huh that is so annoying. The plants that you haft to buy are too expensive and why are plants from the first game that I need to buy 5.00 if too expensive. This game used to be so much fun but now its impossible to progress without buying the premium plants..After the first three worlds its almost impossible to progress without paying. And you have to pay for literally everything. $5 per plant is totally insane. The microtransactions should atleast be reasonable. I would have gave this game a 5 star rating but I paid for some plants.I waited for a little while and all it said was pending which makes me mad.I paid for more plants but it kept saying pending.After a little while I got back on but what I saw was that nothing happened.I checked if I got my plants but I saw nothing.creators can you fix this problem. I want my stuff please okay. Amazing Game, But Where Is The Other Parts Of The Soundtrack? Good but please remove the stupid line up 3 in a row levels. I still really miss random gems and costumes. Battlez is rigged and OK to play. We need new worlds and I miss costumes so much. First of all, it’s amazing. But it really, really desperately needs more worlds. More easy worlds after Egypt, more in the middle, and more at the end, and they should all be added all at once, and then more worlds come in the future the same way. Second, THE “TIME REMAINING TO BUY COSTUME” OR WHATEVER THING COVERS UP THE IMAGE OF THE PLANT WEARING THE COSTUME. I CANT SEE IF ITS GOOD OR NOT. But most of them are really bad, honestly. Third, I think once you defeat a level, it should be available to play with all your plants. This meaning that if it was a special level, with certain set plants or a plant treadmill thing, etc, there should be an option in the top left as the game is beginning like when you would pick your plants if it wasn’t a special round, OR you hit the pause button and then there’s “play as normal level” or whatever button. It would be interesting to try certain levels with any plants we want when it was setup for other ones. This game is the best mobile game out there. No pay to win at all. Plenty of opportunities everyday to get premium game currency. There’s no better game to pawn off a little time that’s as much fun as PvZ2. This game is very good because the plants are good and zombies to etc. but I don’t like that the premium plants cost real money . Then I deleted it because of that to get new games when I got it back they still cost I was hoping you can fix it. I love the game but the in-app purchases are ridiculous. Plants are $5-$10 apiece? I could see $1-2, sure, but that's insane. And some plants are no longer available even though they weren't marked as limited time. Now that EA has enabled cross-platform syncing, I can keep my progress on both Android and iOS! Graphics are great, and very addictive. I wish it was immediately easier to sync though. Force quitting and reopening the game is not immediately understandable. Been a long time fan of the PvZ franchise. I've bought several different PvZ games at times. The gameplay in this one is reasonable but the costs are excessive and the ads severely limit the fun. Not just ads - lots of ads. Some of them can't be dismissed - you have to force-quit the game to clear it. I don't want a game that just launches ads for me. I can find other ad viewers that cost less. I came back to this game for the compelling content but these negative experience keep pushing me away. One of my most favorite games, ever. This is one of the best games I have every played! It’s very addictive and fun yet simple, if I’m ever bored I play this game. I would give it a 10 star rating if I could! EA certainly doesn’t stray from their typical excess of in app purchases, but most are innocuous enough. The daily challenges and weekly battles bring much needed variety to this otherwise slow game. 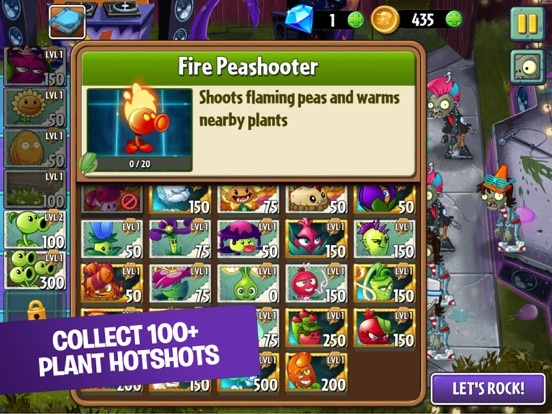 Most challenges are painfully easy with upgraded or boosted plants, but they are by no means repetitive. Find a couple premium plants you like, but by no means buy them all. It’s a waste of money. Gems are plentiful and are a perfectly good substitute for your hard earned cash. I LOVE this game because so much work is put into even the small pieces in the game! After playing PvZ 1, I was really excited for this game, and I am not disappointed, but as a player who played it when it came out, and getting the Aloe and Electric Current Plants through their epic quests, I’m a bit sad that a can no longer get these plants since I transitioned to a new device; the game has no issues, but if you do take feedback from these reviews, please add back the epic quests for the 2 plants mentioned above, as I’m sure many would be happy to use them again. Glad there is an overhaul of the Battlez portion coming soon. The current scheme has become too much to hold my interest for much longer. Same grind every day only to see someone’s score jump significantly at the very last minute. I don't have the kind of time to stay competitive, especially when I cant make it past a streak of four or five wins (sometimes not even one) against players that seem to achieve a streak of twenty wins in the first hour of play alone. This is just not fun anymore. The fact that you are forced into buying good plants and don’t get an opportunity to earn them through gameplay is evil. I wish the creators didn’t base the second game on greed. This is a good game but it didn’t save my progress from yesterday. I tried playing today but all my progress started over. Why? I love the game but every time I beat a board the message just keep popping up and it will not let me move on. I have to force close the game to play the next level or any other level. Hello. I enjoy playing this game, completing the insanity quests, etc., but it is getting old. Why is there no more worlds to explore? I know the Chinese version has 2+ more worlds than this version, but I don’t live in China, nor do I speak or understand Chinese. I know that you probably get this request a lot, and I know I’m just a normal mobile game player. However, I know a lot of fans are expecting new worlds. So please, add new worlds! If you’re stuck on a few ideas for new worlds, try these time periods: The American Revolution (The zombies are coming! The zombies are coming! ), Vikings (Idk what to say here without stereotyping), Extremely Far Future (Home on Mars?! ), the 1990s (Internet themed?! ), the 2000s (Bring back some old plants perhaps, such as cob cannon or something from the 2009 PvZ game? Maybe some old zombies like catapult zombie as well? ), the late 1800s (Electricity at its finest! ), the Renaissance (This is a great list so far! The Renaissance was also full of new ideas), Shakespeare times (Peashooter! 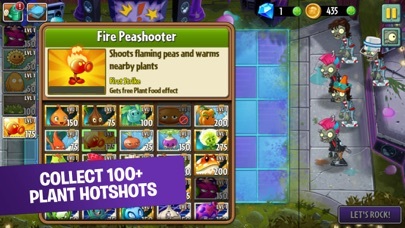 Peashooter! Where art thou peashooter!) and/or when Earth was first habitable by life forms! Heck, and that’s just ideas I thought of in less than *10* minutes! There’s so much more potential to this game than you realize! Please add more worlds, and thanks if you read this review! I hope it gives you some insight of possibly new ideas! I really like the game when you were still doing updating it. I started when lost city part 2 came out and it was good. New plants, old plants and new worlds made things interesting. I even like how each world had a certain gimmick that makes it harder like the cold wind in frostbite caves. It gave more challenge during the story more than the first one. However, now half of the plants are premium and you have to buy them with real money. Plus after level 8 in ancient Egypt you get all the world keys. What happened to the extra hard challenge level that rewarded you with a key. And what happen to the music that made that level fun. All the worlds have now only 2 themes. The normal theme and the end of the world boss theme. I really like hearing the remixes of the mini game theme in each world. (like the matching camel tiles in ancient Egypt or the coconut canons and the buccaneer pirates in pirate seas) Other than that, the game is a good challenge and gives you some good plants. Oh and what’s up with the piñatas in the world map. If you played the game before the update that introduced them, all of the piñatas would be used and you would get nothing out of them. If you just fix the premium plants, piñatas, and somehow get the music back for the mini games and challenge levels (like the levels were you used to get a world key when you had to fight a bunch of Gargantuan zombies halfway through the world) the game will be great. Until then the game is ok.
Hey I completed Modern Day and when the new battles came out it was very good news but I realize there is only easy and then medium mode I want part 3 plz and I don’t like how you can’t use your plants to defeat the Boss levels made Hard mode please and I think you should add a plant that is very quick. The boss fight is easier than modern day 30 great work on Frostbite boss level it is kind of hard but it wasn’t enough I want more hard how about you add another world that’s called Zombie Land with Difficulty SUPER EXTRA HARD? I really liked your game but It was the end till I completed modern day 43 Modern day is medium easy and I’m sorry that everyone hates octopus’s and wizard zombie thanks for no voilent and who ever made this game is very nice and selfless the plants are only 5$! Thx a lot but I want hard mode and extra hard mode not just easy mode and medium mode plz read this very nice update I think it needs more plants and the bad thing is Modern Day Plants are better than premium plants when they have moon flower! And what happend to Zombot!!! I miss that guy! Make more worlds atleast 3 more worlds and I will be very happy! Also needs more tacos! I like the “blah blah blah” thingy how about a robot zombie that shoots cannon? Thanks! I love Plants vs. Zombies, and I’ll start off with the positives by saying that this is a very fun game. It’s addictive! I like all the different themes and the cool new plants. Power ups make the game exciting. There’s a lot to do and endless hours of levels to play. I probably enjoy playing this one more than the first one. However, my main complaint is that everything is RIDICOUSLY overpriced. Some plants you have to pay for with real money, $5 a plant is insane!!! It should cost maybe $5 to unlock all premium plants, then that would be reasonable, and Popcap would get way more purchases. It’s sad that Popcap is turning a classic family game into a money grabbing charade. It’s sad and greedy. You can have a lot of fun with this game, but about half the things are locked unless you pay like $50 to buy it all. Anyway, Crazy Dave is back again, but I don’t like how differently he acts compared to the first one. His new personality is annoying and you should’ve left him as the original way he was. There’s a lot to explore in this game, and it may seem a little overwhelming to a new player. It’s a complicated set-up when you open the app, so maybe organize it more. But yeah, I still really like this game, it’s one of my absolute favorites. But please LOWER YOUR PRICES. And continue making Plants vs. Zombies games. Good game but has a Garbage update. I think it’s a great game. I play it all the time, probably to much. But what happened to the challenge of having to beat the Gargantaur Boss fight, to move on to the next Area. I used to play this when I was younger, and I liked how each Area posed a challenge, Like how Ancient Egypt had the Camel Tap or whatever it’s called, and like the Coconut Cannon game in the Pirate Seas, but why’d you get rid of the other challenges? Like in Frostbite Caves, and The Lost City? My favorite was the Lost City Storm, and now with the new Garbage update I can’t play it now. And why did more then half of the Plants have to be Premium?! I mean it’s not bad to want to make a few bucks on a great game like this, but seriously more then half the Plants? It’s a great game and think it has great potential. But I wish Popcap would keep all the special challenges in the different Areas. 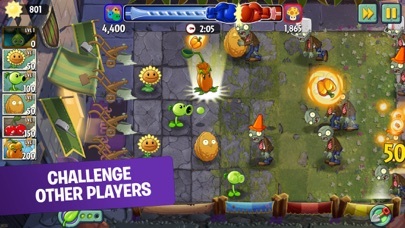 Oh and if Popcap reads this, I think it would be Way Awesome if you did a multiplayer mode where you could like pick a deck of Plants and the other Player could pick a deck of Zombies. I’m asking to much, but if you have another update, please add that Multiplayer thing, cause I would rate you 5 stars if you did. Anyway that’s just my point of view. The first game was a masterpiece. A defense game combining strategy of your arsenal and how you use it. Then... EA came. Even at the beginning of the second one, this game was great! A few premium transactions, but nothing that bad. I come back now, and more than half are premium! Not only that, but it gives you all the keys while you're in the tutorial! Beat the 8th level, and you unlock all of it. Where's the challenge in that? I liked it when you had to beat the gargan-something-or-other of each world to get another key. Why did they make it so you get them all immediately? Not only that, but the regular plants are even mostly premium! You need to level them up, but after level 2 or 3 the seed packets you need to get to the next one are at astronomical levels! Why would they do that? In all, if you want to listen to half of your fan base, give us the option to go back to the old version of this game(with the addition of the new worlds) although, I was thinking. The premium plants appear in a special type of space that doesn't exist anywhere else. After you beat the game, maybe that could unlock a super hard world, but if you beat it, you unlock all the freemium plants, in that blue matrix style. This is definitely the longest game I’ve ever played on the App Store. The game was very fun to play and I recommended it to literally everyone I know. Let me just say I’m honestly fine if no more worlds are added because I’d say Modern Day is a good way to end it off. If there was another world added though, I’d suggest bringing back more old plants because I miss some of the plants from the first game. Also, PLEASE bring back the music you removed from the game a while back. The music is what makes this game even better. So this is a really, really, really great game, it requires skill and patience. The game gets harder the further you go into it and it can definitely get really hard. I totally recommend at least trying this game. If you do try it though, do not skip worlds. Play them in order and go to the next world once you beat the first boss and maybe only boss of each world (if you don’t the levels get really hard, you should come back to those levels once you’ve beat the game) to have the most fun playing. I really enjoy this game. The colors, the game play and new plants and zombies. I like the traveling to different times. I like that you get to level up your plants. I like the battlez. I don’t like when you get to a certain point in the game it starts becoming impossible to past levels. Every world in this game has a level that is unbeatable. you don’t get sun quick enough and there’s too many zombies that you have to kill. It’s almost like they slow the plants down but spend the zombies up. leveling up your plants is really hard you only get a certain amount and it’s not each level you beat it’s like every 4 levels you beat you get packets. I mean I understand that they made a little more challenging than the first one, I think they made it way too challenging. you have to spend money if you wanna continue playing the game. You have to purchase with actual money some of the plants that you are used to in the first one. Not everyone can do that. I feel like they geared this game towards people who could pay and will pay. I’m deleting game sadly. I’m tired of not being able to getting any farther in the game. Pretty good but a few things must be added! I love this game! You can do so much with it. I love the variety of zombies and plants and I just love to hear Crazy Dave and Dr. Zomboss talking! Once at the very end of a wave, I trapped in zombie in between two wall-nuts and I drew tons of things out of plants and he is still alive to this very day! It is so funny to trap the last zombie and never ever kill him! 🤣🤣🤣 I kinda feel bad for him at the same time though spending his entire life eating a plant that keeps getting replanted as soon as it dies. I like the zombies. That reminds me... You should add a function to where you can be the zombies. Also add multiplayer so one person is on plants and one is on zombies. Make it so that there is zombie levels just like there is plant levels. I love the zombies. Make a level where you are Dr. Zomboss too! Also make it so you can level up zombies. I think it would be so much more fun if you add a function where you can be a zombie. I almost wish zombies were real. But that would probably be bad soI wouldn't really want them to be real. So please add this!!! 🙏🏻🙏🏻🙏🏻 I'm begging you!!! I'm almost ready to quit. I’ve been playing this game since it came out and I have always enjoyed it. Until now I would have given it 5 stars. The problem started when they began the battles. I like the battles but it’s so hard to play without spending real money. I would go back and replay worlds because I enjoyed them as well as being able to collect coins and gems. You can still get coins in these levels but no gems. They give you options to earn gems but very few are rewarded. This becomes a problem because you can’t really keep up with battles when you don’t have enough gems. They offer 2 free plays and you can watch 2 ads for 2 more. Most of the time you get a message stating that there are no ads available. Three days went by without being able to get free gems or gauntlets to be able to battle. I enjoy the battles but I am not able to spend the money therefore I can’t advance in the battle levels. This was a favorite game of mine but now I’m really disappointed. Will more new worlds ever appear? I really enjoy this game, and I loved its predecessor (which is still on all of my devices). I've been with PvZ2 since its official release-8/13. There was always anticipation to see what world would be released next and what features each one would bring. Then along came the Piñata Parties! Normal at first, with new seasonal/themed ones appearing over time. But then... no more new worlds came along. Instead, it was a plant-leveling scheme (not a complaint, I like it). Now there's a "Battlez" mode. What do you compete for and win? Just more plant seeds for leveling up plants. Why not fight for "Keys" (maybe 300 or so) to unlock a new world? Will we ever get new worlds in this game ever again? PopCap, this is a great game, but it needs more new worlds with new zombies. Bring back that creative magic that you had when you launched this game with the prospect of many, many worlds (where's Rome, London, China, Japan, etc.). I'm hoping there is a future for it (for new worlds) beyond this plant-leveling aspect. Long story short, they use sneaky ways to force you to pay. Otherwise you’ll never level up. Goes from fun to tedious. And there is no way the people I’m playing against just happen to kill me consistently on levels 6 to 8 on the tournament with such low level plants. I’ve since read they’ve been using inside game bots not other players so I’m not actually competing against anyone. Just a game trying to scam me out of real $. This seems legit since it is physically impossible to earn that many points in the short amount of time - even if the person won every single round and played for 10 hours straight. Unless you shell out serious cash or you are a bot, you get stuck in tournament limbo because you can’t move to the following week’s level unless you are in the top 3 spots and if you stop playing you drop down to the previous levels until you are rock bottom. I’m ashamed to say I’ve spent $ on this game rationalizing having fun. I’ve also been charged for something that had been marked free so look out for those misleading bugs. Now it is just boring and tedious. Also, it’s been a few years. Where are the new worlds already? Fun game but real long grind. I have played the 1st PVZ game and mastered it pretty well, so I was very happy & excited when PVZ2 came out. It’s a very fun & great game to play, multiple levels, so many more plants to choose from & so much more, the only draw back to the game is the real Iong grind it takes to level your plants. If there was a way players could pick a specific plant they want to level up with piñata’s instead of hopefully getting piñata’s for that specific plant by luck, also increasing the amount of points of piñata’s to level plants would be great improvement from only getting 3-5 regularly. Even when you spend money on world piñata’s to luckily get points for a specific plant it’s still all by luck & chance if you get points for that plant, for example 100 Egypt world piñata points is spread across multiple plants instead of players being able to apply all 100 points to one specific Egypt world plant, I still love playing the game but really hope some kinda improvements like I said. As of July 5th, 2018 You guys have had a number of “bugs” and “glitches” in this game that prevents players from getting free gauntlets or free gems anymore by watching ads. That is totally unfair but more disturbing than that, I suspect purposely done. I have been playing this game for long enough to know when something is a legitimate glitch, and when something is being done on purpose. Like the Bee in the nursery NO LONGER WORKING. That’s a purposeful act so that you can get people to spend money on gems. Now it seems that even the commercials are no longer a way for people to collect jams as well because you want people to spend money to buy the upgrades to play the game. I don’t mind buying gems once in a while, but don’t be sneaky and purposely mess it up so that nobody can get free stuff anymore. That is low and dirty. Why ruin a good game by being GREEDY? As a matter fact I was suggested nobody download this game anymore until you fix those bugs. I love this game and have been playing it for years. However, the recent competitive Battle mode upgrade has been causing too many glitches. It’s fun to play, but with the addition of something called Filamints, I frequently don’t get bonus gems for Free Plays which also effects getting 10 gems for completing all the day’s events. (You use gems to buy gauntlets that help you to play without paying money all the time.) I buy upgrade stuff now and then when I can afford it. I am getting sick and tired of how so many games can’t be played without paying lots of money - 3-5 losses and your done for hours or spending money. With Battle mode I can’t compete if I can’t afford to buy anymore stuff to play or I am a super star gamer. I’ve never felt this way about PvZ2 until the addition of the Battle mode. I’m downgrading my earlier review to 4 stars until this is fixed and until they do something about the pay for play issue they have created with recent upgrades. I beat the first PVZ in no more than 3 days. I’ve always loved it and redownloaded it to play again. When I beat it I decided to get the sequel. I feel like this game had sooooo much potential but it was ruined by the UNFAIR AND OVERLY DIFFICULT progression process. In the first game it was simple to find a way to beat the level. I only ever lost ONE level and had to redo it. With this game I’ve lost multiple times and every “premium plant” is 4.99 a piece!!!!! I don’t think it’s fair. It seems like the creators got greedy and tried to rob us players which is very disappointing. Another thing is you have to upgrade plants now and the system to get seed packets (basically loot crates) is random and you often get packets for plants you don’t have so it’s difficult to move forward. I beat the first boss but can’t go any further than that becasue my plants aren’t upgraded enough and I’ve already used up my slots for piñatas which only refreshes every 5 hours or more??? 🙃 idk it’s just really disappointing and I can’t enjoy the game like I used to. Not worth it unless you can spend $20 on an app. I love Plants vs. Zombies, it’s a fantastic game! I love the fact that you get your plants and go through different time eras and kill zombies. I also love that you can compete with other players to get more points. But I think they need to add more, first off they really need to bring back versus mode where one player was the plants and the other were zombies. Except this time you could choose the time era. Then you could play with your friends, BUT you could also choose to find a opponent online and this time you wouldn’t choose which side you were instead you would be randomly chosen as a plant or zombie. You would be able to choose your plants and zombies but it would have to correlate with the time era, (the modern era could be like the hard mode where you could choose any zombie.) Also it would be more expensive to use abilities like flick and electricity, maybe like 1000 more to make it fair for zombies. Also this would be great if you could make abilities for zombies. Maybe like spawn graves without grave spawners or spawn potions idk. That’s all I have to say for that but here is a second thing, you need to add like an account system for if you transferred phones or tablets, so you don’t have to start over. And you would have your in-game purchases. I will give 5 stars if this game adds these features but until then it’s still a great game and you should download it. Thank you for fixing for iOS 11!!! I love this game! Unlike most other games out, I can play at my leisure and not be punished for forgetting to play it one day. Even if I have already finished every level, there’s the twice-daily piñatas I can get, the daily piñata level, and all the endless levels! Very well put-together game! I have read other reviews where people claim this game is a cash cow and that it can’t be beat or even enjoyed without spending money. I can’t disagree more. I have been playing this game since its release and haven’t spent any money on it. I have beat every level. Never needed a premium plant. The ones that complain clearly have little skill in tower defense games (that’s really what this game is, if you take away the bells and whistles) and can’t manipulate the in-game mechanics to play successfully. Yes, premium plants would make the levels easier but it is certainly not impossible to win without premium plants. Thanks! I love this game but there are some issues.. This is a awesome game and I respect it, but some of the plants are way too overpowered. I won't try to be a critic but this is just my opinion so you can like these ideas or hate them you can say it since I don't care .I'll Give some examples, the Parsnip. Parsnip 3 shots zombies even at level 5 it instant kills zombies. A way to nerf him is to, 1, Decrease his Damage or 2, make him cost more. The primal Sunflower. Primal Sunflower is too fast and sun production and can make you produce sun like never before. A way to nerf this is to make it cost a little more ( about 100 sun than 75 sun). Lastly GOLD BLOOM! First, it's way to much value for 0 sun, I know it is a premium plant, but that has no excuse to be that powerful. A way to nerf this guy is to lower its sun burst I MEAN IF YOU IMATATE THE GOLD BLOOM IT WILL BURST OUT 750 SUN WHICH IS NOT COOL. That is all the plants that can maybe be nerfed slightly It is just my opinion so you can say something else if you like. The first PvZ was phenomenal, no one doubts that, and as such everyone had high hopes for the sequel. It obviously isn’t fair to expect the same greatness as the first, a mixture of nostalgia and old-school comparisons give it an unfair edge, but this game still is subpar. Don’t get me wrong, the basic premise is the same: plant flowers, gain sun, kill zombies, but there is one gigantic flaw that ruins the game - the shameless cash-grab. Some of the most iconic plants from the first game are locked behind a paywall (notable torch wood and snow pea), among others that obviously had more effort put in than some. This wouldn’t be so bad if it was a small fee for everything, kind of like buying the full game, but EACH plant costs $5, an outrageous sum that totals to more than the cost of the original game. That’s not all, as they imputes a new mechanic to “upgrade” your plants, making them stronger, come back quicker, and just be more powerful. The problem with this arrises when the only way to get past some stages is to get upgraded plants, and you do this through the infamous loot box, bane of free-to-play games, and makes this game a heap of steaming, greedy trash. There’s just no way this game deserves the amount of money it is asking for. At $5 per premium plant, you could spend around $100 easily. That isn’t even enough money to start leveling up your plants. For $100 you probably won’t get enough seed packets to level a single plant to max level. Aside from all of that, the game is fun. I enjoy playing through the levels for the most part. I guess another issue I saw was that for the number of worlds that there are in the game, there is very little variety when it comes to the zombies. There are maybe 4 or 5 unique zombies per world, and in each world you have to play through around 20 levels. Once you beat the first Zomboss fight in each world, you aren’t really able to continue until you’ve either spent hundreds of dollars on the game or have grinded for hundreds of hours to earn enough seed packets to level your plants. In the end, it’s not nearly as much about strategy as the first game was. It’s about this company trying to steal our money through lazy ideas. PvZ2 was an intriguing game when I started a month ago. I liked doing my attacks. I liked the quests. It was interesting. A week and a half ago, I stopped playing entirely. The quests became pointless as u only get rewarded plant upgrades only for plants u have to buy. After several of the quests, my interest began to dwindle. Every day...same results. What was the point of playing if I can’t make progress? My wife has played off and on for the past year. Maybe longer. IDK. She plays, quits for a month, resumes, quits. Endless cycle. Simply put....it’s an average game. Want to make it better? U need to keep all players engaged for long periods of time. Whether through hard work or purchasing for faster progress, u need to create an equal opportunity for all players to make progress and obtain new plants. Yes, ALL plants should be available through purchase of gems, not having the bulk of your premium plants available only to those that want to spend money. I downgraded my score because The problem of ads crashing the game still hasn’t been fixed. See below. I love the game itself; it’s been so much fun to wipe out zombies. Lately, when I go to watch an ad on my old iPhone 6+ with iOS 11.4.1 (which you have to do to earn gems or coins or to continue the Piñata challenge), the ad freezes up to game, so I have to force-quit the app. I don’t get credit for watching the ad (which doesn’t play anyway), and it also messes up my place in the Piñata challenge. If a different ad plays, there’s no problem, but lately, it’s stuck on this one ad that crashes the game. The screen goes black for about five seconds, then flashes white, and goes black again. If you drag down or up you can get a white box to come down or up but it snaps back to black when you release. So this game is epic we all know that! I mean cmon who doesn’t know about this game right? This game truly is amazing but their are some things that I wish would return. First let’s talk about the premium plants. There used to be an event a while ago where certain plants would go for gem sales instead of $5 payment. If you could bring that back I’m sure everyone could enjoy the game with a little bit more variety added to the game. Second, the same time the game can out the premium plants only used to cost $3 which is probably a way better price for these plants instead of a whopping $5. But hey that’s just me talking and my wishes but that doesn’t mean I’m making the devs do something they don’t wanna do. If they don’t wanna do it they don’t have to. I’m am just writing this review to make my game experience better than ever! First of all I love plants vs zombies 2. I’ve been playing long before far future came out and loved it ever since. Unfortunately, the way it’s going is definitely more downhill. You probably get this a lot, but we need more worlds. I see that the updates are mostly focused on battlez right now, but maybe after all the mints get their turns just put them in a rotation and update the part we want updates too: the adventure mode. Whether it’s adding more to old worlds or creating new worlds (which, considering how many choices there are, would be very simple to make ideas for), we need a new addition to this. 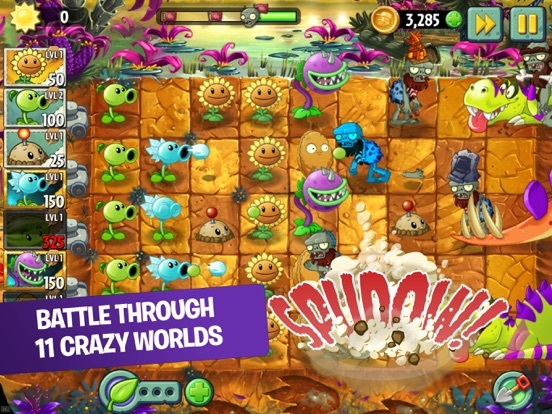 It is the main focus of the game, and it has been at it’s roots (no pun intended), since the first PvZ. If we don’t get any adventure updates soon, PvZ 2’s 15 minutes (or years) of game will likely come to an end. Alright, I have been a fan of PVZ games since I was little. I played ALL of Popcaps games such as “Garden Warfare 1 and 2” “Plants vs Zombies Heroes” the first Plants versus Zombies and even the Chinese bootlegs. But this game isn’t the same, the spark is gone, and my favorite plants are locked behind bars. What I find insane is that for ONE plant it costs 4.99 or 5.99 or 6.99. Even Gold Bloom costs money now( I got it for free back then). To fully get everything in the game, you will need at LEAST $100. It’s stupid. Gameplay wise, it’s fun, if you have upgraded plants,( which I do so the game is fun) and also I LOVE the new multiplayer game mode, and I have a suggestion, can we have a multiplayer mode where we have to players on the same side fighting DR Zomboss? It would be pretty cool. Each player would only be able to pick 4 plants. And they both share sun. But they start off with 1,000 sun. That’s it thanks for listening. Good game, but game breaking glitch. I just wanna say, this is a pvz game. There’s bound to be glitches. Im not writing a negative review. But there is one thing that breaks the game so i cant play it. Whenever i beat a level now, it doesn’t freeze my phone, but makes the app not respond. I tried completing the snow pea epic quest, but on the final level, i got greeted with a message saying, “Leveled up plants are amazing! Be amazed by not-so-simple peashooters!” Whenever i tap anywhere, the message goes away, but then reappears. If i wait it out, it goes away and reappears. This forces me to close out of the game, mad at the phone. So Popcap, if you want to convince me not to delete the game, fix this glitch. It’s becoming frustrating that the only thing i can do is go to the zen garden and/or read the almanac. Im a big fan of Plants Vs Zombies, but this glitch looks like the end of PVZ2 unless it’s fixed. Lemme start off saying that this game is very good, however as it continued like many games it went away from the classic idea and went downhill. 1st off, there are way too many premium plants that are literally modified classic plants that are unnecessary and make you feel like you are not getting the whole game, 2nd the leveling system short after the release of modern day was 100% dumb, it's a strategy game that allows you to switch to plants with different SET damages and tactics to help you beat a level, by adding this system, they have already defeated plant selection purpose, in other words a peashooter and a repeater could do the same damage, so why ever take the repeater? The leveling system and the updates this game got ruined for me slowly to a point that I found it no more fun. I would rather play the 1st version of this game than the one we have now, simply because PvZ 1 is better at this point, with more logic behind their game, and no stupid updates to change the once great game. Yes, there are in-game purchases and they’re ridiculously high-priced (like ONE plant for $5 or a bunch of crystals for $100). But buying them is optional and the game is just as enjoyable and winnable as it is—just a little more challenging. Playing and following the progression you unlock many plants that will allow you to win. 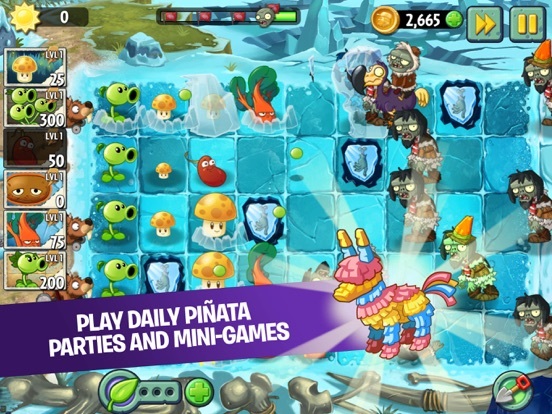 The different quests and the different levels keep the player entertained and the routine away. Some of the texts are really funny—with ridiculous and hilarious puns, especially the plant names or the description of zombies. There are about 10 worlds but they tried to make things not too linear so you can quickly hop from one world to another. 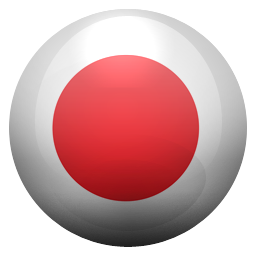 The gameplay is smooth, responsive, precise, the animations are pretty, and the sound and the music are also very well done. Difficulty levels are not really what they say, however. The first worlds are supposed to be easier than the later ones, however it was much easier for me to beat all the zombies in the later levels. Some levels can be very, very difficult, but for the most part you’re not stuck as you can always do daily quests, replay older levels or visit other worlds. Overall an excellent game that will keep you entertained for many, many hours. Plants VS Zombies has always been one of my favorite games of all time, and this sequel isn’t far behind. Each world has super creative mechanics that add difficulty to the level. Even though the premium plants do cost real money, I’m certain that the game is playable without them. I would even recommend spending a couple bucks on at least some of the premium plants though, because some of them are just super fun to use! My only critiques for this game would be that some of the levels, particularly in the Jurassic Marsh, are unreasonably difficult. I also think that the player should only be able to earn seed packets for premium plants that he or she already owns, because otherwise you just end up with a bunch of useless seed packets when unlocking some piñatas. Overall, an amazing game! I love this game to death, but lately there’s been frequent glitches with the ads. Not sure if it’s just my older phone (iPhone 6plus) that doesn’t want to keep up with a complex ad... but most ads play just fine. Many days, there’s one ad that just freezes on a black screen, and I can never get credit for watching it- or get past it for a different ad to load instead. So I can’t collect the bonus gauntlets, or increase my diamond stash, because of this one ad that won’t fully engage. I wish I could tell you which ad it is! But it won’t even start, so I can’t tell! To get out of it, I can only force the app closed, and restart the app. If I don’t, it will remain a silent black screen till the end of time. Other than that, I truly love the game, and am desperately addicted. Fantastic game. items from store won't download. It took a long time for the app support page to load (and I have fast internet)I am frustrated that I can buy content, but it won't load. I wish I had money to throw away, but I don't. I work hard for the petty amounts I earn. The content I ordered was supposed to be a gift for my kid, and it has turned into a nightmare because I can't get it to download. Update:I feel Popcap is doing everything possible to avoid helping me obtain my purschase. In the fist email it was kind of hidden that they wanted proof the purchace, the second email asked for a screenshot, of proof of purchase, third email says we need it in writing from iTunes, only ITunes never sent the reciept to my inbox. I've only found it im my account. What hoop do I need to jump next to get the digital content I purchased?!! And seriously all the details are in the screen shot, can't you verify it with iTunes? The last time I played this game was when the second half of the final world. So, a lot has changed since then. My biggest complaints are more ads and the gargantaur levels and boss levels on the world screen were less grand than they used to be. One of my favorite thangs to do was compare the gargantaur statues. And to add insult to injury, the song from the aforementioned gargantaur stages and minigames lost their cool and catchy tunes. This really bothered me through my second playthrough and as I went through the levels I didn’t enjoy myself as much as the first time. Although, the extra levels were an awesome touch. Popcap if your reading this, please, as a huge fan of this game, I want to have the best time possible and fixing this really simple problem would do so. If that problem is fixed, it would be an easy 5 stars for me. The original Plants Vs. Zombies is such a well loved and iconic game. This game is completely the opposite. You know a game is bad when you can’t beat one stage without going and doing half of the next one. It’s also such a disappointment to see how much greed has taken over the whole game making process. When levels go from brain feat easy to physically impossible to beat without spending real money you know there’s a big problem. They ruined my actual favorite parts of the first game: mini games, puzzle games, and zen garden. No more can you play creative and joyful mini games or puzzles. In addition, the zen garden is just another way to force people to pay money to speed things up. I loved looking at my little plants grow up and being able to get new habitats with in game currency and not real money. They changed everything in their game and in turn have made it almost unplayable due to the sheer anger and boredom the game brings. Please just stick with the first one. It’s actually a great game. I Love the game so far, but I’ve run into a lot of problems along the way and I’m not that far into the game. The first problem is and was that after only a few levels it became insanely difficult to where it’s like you have to purchase a premium plant(s). The other problem I ran into was with 1 zombie in particular being unbalanced, the zombie is the newspaper zombie who now downs anything in one go, where as in the original plants vs zombies it ate away at your plants at the same rate as a normal zombie. My final current problem with the game is that I can’t get into the game at all, it keeps crashing every time I open it. However other than that the games really fun. I’m enjoying some of the new plants and new game modes, but it would be nice if endless mode could come back. Excellent game, been playing it for years now and it doesn’t get tired. For the “battlez” update, i really do like it but a few things ruin it. Too many lopsided matches, the sequence of the plants coming out changes to give advantage to those with stupid higher levels and if you happen to pause the game to do something real quick, when you come back to it the app has restarted and you’ve lost a possible win. I think there should be more adventures developed so you can maybe unlock premium plants. Whatever happened with the update where you played the piñata of the day where you could collect diamonds too? It’s great for coins but to earn diamonds you pretty much have to buy them or be content with the possible 25 a day you can collect. Re-evaluate please. PvZ 1, but ruined by in app purchases. The original Plants vs Zombies invented a genre and knocked it out of the park with a lovely concept, great gameplay, and a pleasing progression. PvZ 2 should have been the easiest game in the world to develop. All they had to do was create a bunch of new plants and a few new areas, keeping pretty much everything else the same. They did create a bunch of new plants and a few new areas, but they murdered the progression of the game. 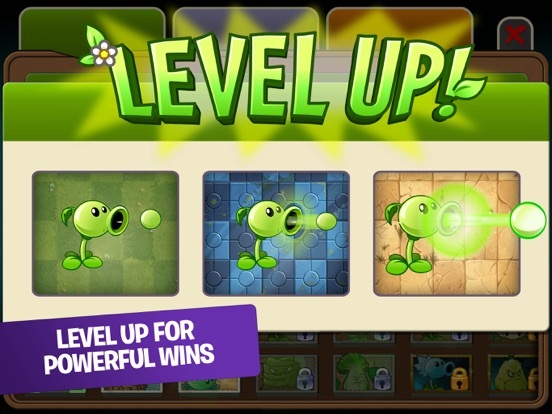 In PvZ 1 the player got a new plant every level, making each subsequent level an adventure in figuring out how to use the recent unlock. 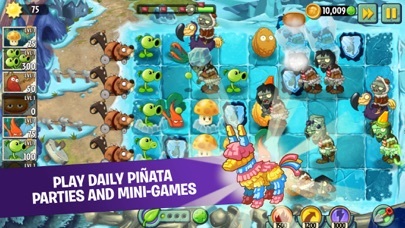 PvZ 2 unlocks new free plants once or twice a world, with the vast majority of the plants for sale in a real money store. In order to unlock them all you’d have to pay a total of way too much, after which you would enjoy them and then grow bored, with no further progression to be made. 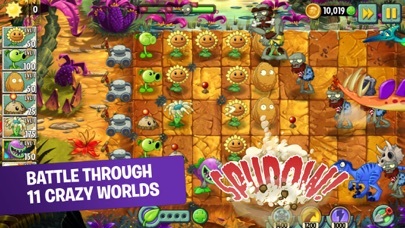 The worst part is that it didn’t have to be this way PvZ 1 was wildly popular, and it would have been a perfect ad for PvZ 2. If they’d kept the progression model the same as the first game, shown off some new plants/zombies, and slapped a $6 price tag on it, I would have bought it in a heartbeat, as would many others. Instead, I played for an hour or so and gave up because I wasn’t having any fun and was mad at the devs. What a crying shame. Don’t play this game. Do play Plants vs Zombies 1. It’s some of the most fun you can have with your phone. When I first heard that Plants Vs. Zombies was receiving a sequel, I was ecstatic beyond belief. The day it finally appeared in the App Store, I downloaded it and began playing in a heartbeat. But then, I realized... EA was involved. EA turned what could have effectively been one of the best mobile games ever into a greedy cash-grab. If you were to try to purchase every single plant and upgrade in the game, you would be paying over a HUNDRED DOLLARS. At that price, I could purchase the mobile rendition of Minecraft 14 times over! Also, to add to it, these items provide an ACTUAL advantage to the gameplay, meaning that, basically, you are paying for an easier experience. WHEN WILL YOU LEARN, EA. So, in conclusion, if you REALLY want to play this game, I won’t ( and can’t ) stop you. However, be warned; this is just a ploy for EA to make a quick buck. For the sake of humanity, PLEASE don’t waste money on this shallow trick. First I hate how everything cost real money including gold. It's really stupid that we need real money for gold because spending real money for gems was enough. Electronic Arts, u need to stop making us spend real money, because if u do, no one will want to play this game anymore. It's stupid, and u can't make us play this game. If u keep up this stupid way, then no one would play. We ain't going to spend real money just so u could make money and not spend it on improving the game. Unless u return everything to normal and hand the game over back to Popcap's leadership, this game ain't going to get anymore better. In fact it will only get worse. Everyone rather prefer to spend gems to get premium. I've read comments on how dandelion uses to be purchased with gems and now real money. This is all ur fault, Electronic Arts. Those stupid changes of ur has cause u to lose players and fall down the top game charts.